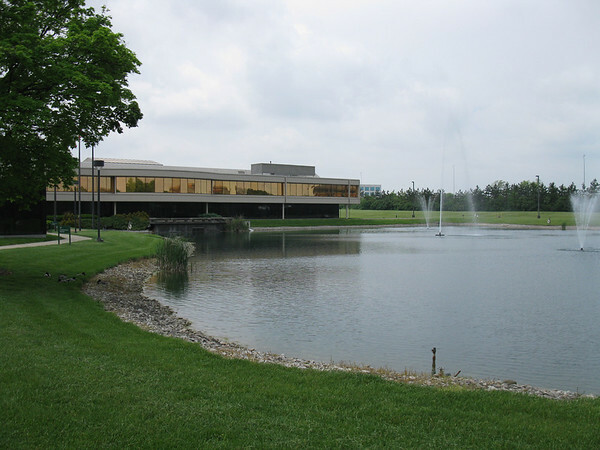 I had never been to the OCLC main campus before, but I was pleasantly surprised that it was not difficult to find or reach. Even the 75-minute commute from my house to Dublin (a suburb of Columbus) was quite tolerable that particular morning. (The afternoon was a different story, but that’s neither here nor there.) The conference center was quite far from the main entrance, and I think I might have gotten lost if someone had not put out a half dozen or more lovely signs pointing me in the right direction, practically all the way to the very doorstep of the building. Once I visited the registration table and got settled in, I pulled out my cell phone. See, this is the first conference I have attended since joining the hip kids and getting a smart phone, so I decided I was going to do some “live tweets” of the activities. 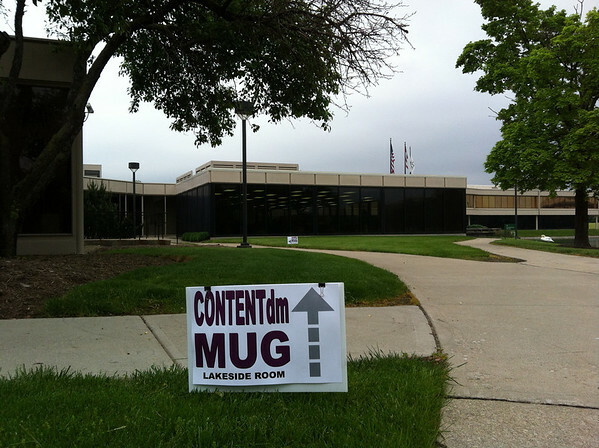 The agreed-upon Twitter hash tag for the event was #cdmmug2012. Planning committee member Janet Carleton (@jcarletonoh) and I (@LisaRickey) and a handful of others made good use of it. I think I managed to tweet once for every session I attended—for which my husband later declared me a “dork” (but, as a positive thing)—and most included a photo (some of which I will include here on the blog, but if you want to see them all, check my original Twitter feed). For the first session, Christian Sarason, a product manager for CONTENTdm/OCLC, gave us the latest on what’s in store for CONTENTdm. Among the features they are working on (for release hopefully in 2013) are enhancements to Favorites and performance; implementing full HTTPS; search engine optimizations (e.g., your stuff being found on Google); and implementing the ability to actually create groups of collections. In the more distant future, they have some updates in mind for the server side of the software. OCLC has begun using the scrum method of software development, and so the biggest “take-away” I got from Christian’s presentation was: Tell OCLC what you want to see in CONTENTdm because they are eager for your feedback to help with improving the software! Many of the day’s time blocks consisted of breakout sessions, wherein participants could attend either a formal presentation or a “Birds of a Feather” discussion on a certain topic. 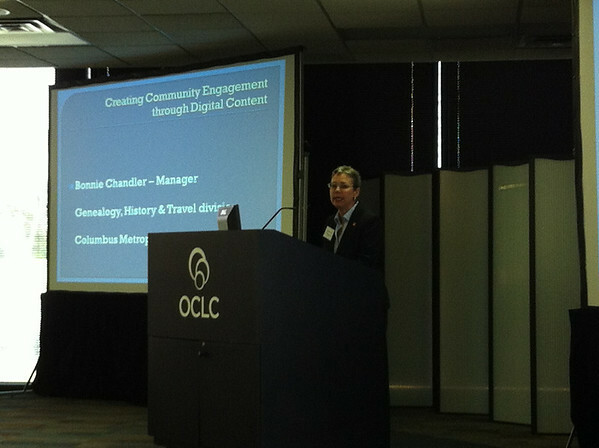 I attended the presentation, which discussed two collaborative projects—Columbus Memory and Columbus Neighborhoods—embarked upon as part of the Columbus Bicentennial (2012) celebration. Columbus Memory was a grant-funded project, the purpose of which was to create a digital archive of Columbus history, help other historical societies and organizations digitize their collections, and provide local history resources for Columbus teachers and students. Columbus Neighborhoods was a collaborative project with WOSU whose purposes was to record and share stories and memories of various Columbus neighborhoods. I was most interested in the Columbus Memory project, because it involved the Columbus Metropolitan Library’s digital archive hosting not only their own images of Columbus history, but also images shared by other organizations and other individuals. In some cases, the original materials were actually donated and then included in the project; in other cases, the original materials were borrowed, digitized, and returned, but the digital representations still shared online. As relevant, Memoranda of Understanding or Deeds of Gift were signed by involved parties. I was particularly interested in Columbus Memory (especially its nitty-gritty details) because we (in my department at work) have periodically brought up the idea of possibly conducting a similar project wherein patrons could share their historic photos through the library’s digital archive. So I was very interested to see how another Ohio public library handled a similar project. Breakout session #2 included a Birds of a Feather discussion on Customizations or a panel discussion on “Collection Infrastructure: Defining, Expanding, and Reshaping the Organization of Collections within CONTENTdm.” I attended the panel discussion, whose participants included: Ann Olszewski (Cleveland PL), Karen Perone (Rodman PL in Alliance, Ohio), Kevin Drieger (Library of Michigan), Lily Birkhimer (Ohio Historical Society’s Ohio Memory), and Shannon Kupfer (State Library of Ohio). I attended the panel discussion, in which the panel participants shared many interesting ideas about how to arrange (and re-arrange) your CONTENTdm collections. Another neat idea I got from the Infrastructure panel was to create a standardized “Person” field with a controlled vocabulary, so that items pertaining to a certain person can be accessed across all collections. I suppose the same could be accomplished with regular subject headings, but I thought it was an interesting idea to break it down further. I attended the discussion. Although Dayton Metro Library hosts our digital collections on our own servers, rather than being “hosted” by OCLC (which is what is meant by “hosted users”), I thought it would be interesting to hear what the hosted users had to say. It turned out that about 2/3 of the participants were hosted; the rest were just interested in the subject. One resounding theme coming from those who had chosen to go with the hosted option (even though it costs a little more) was that they went hosted to avoid the IT headaches from such things as doing their own software upgrades or trying to gain a coveted spot on the priority list of their institutions’ IT staffs. With the hosted option, CONTENTdm upgrades happen quickly and painlessly, although one trade-off is a loss of flexibility for doing customizations. After this discussion, it was time for lunch. After eating my lunch, I took a little walk outside. Not surprisingly, there were a lot of ducks near the “Lakeside” Conference Center. 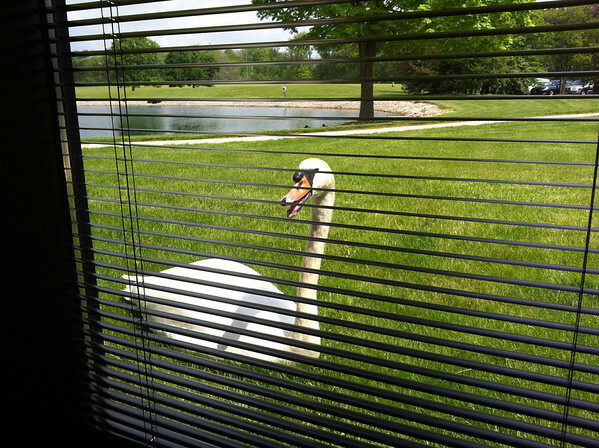 I was, however, surprised to see a large swan, whose named apparently is George. He had made a nest for himself near one of the windows of the conference center, where he spent most of the day. There were a few times where he kept walking along the windows. I joked that maybe he wanted to learn about CONTENTdm, but okay, he was probably just looking at his own reflection. I attended the presentation, which discussed a major undertaking of digitizing two historic newspapers using limited staff and budget, by working with the Lyrasis Mass Digitization Collaborative. Among my favorite parts of this presentation were: a real numbers breakdown of data and costs; examples of how to use the concatenate function in Excel to automate some of your metadata (and save tons of time! ); and sharing about some of the metadata headaches. The main headache was how to deal with volume and issue numbers that failed to follow a consistent pattern over the years. (Now, not to sound “glad” that UNCG had metadata nightmares, but I think we can all relate to that feeling of “oh good, it’s not just me,” knowing that other people also find—and have to deal with—weird stuff! I think deep down we all know we’re not alone when bad/weird things happen, but it’s nice to have it confirmed once in a while. Ha!) You can check out the digitized newspapers (and their other projects) at: http://libcdm1.uncg.edu/. Breakout session #5 options included a Birds of a Feather discussion on Workflows or panel discussion on “Repurposing and Extending your CONTENTdm Content,” with Janet Carleton (Ohio University) and Sara Klein (Upper Arlington Public Library). 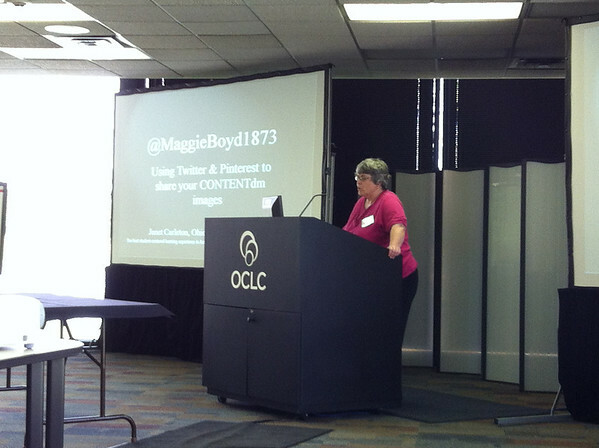 First, Janet Carleton told us about a number of cool things they have been doing with the Maggie Boyd project. Maggie was the first female graduate of Ohio University, and her 1873 diary (her senior year at OU) was digitized 10 years ago for Ohio Memory. Now, they are repurposing Maggie’s digitized diary in the form of the @MaggieBoyd1873 Twitter feed, as well as WordPress blog posts and Pinterest boards about various aspects of Maggie’s world. The social media items link back to relevant images of Maggie’s original diary, which is served up through CONTENTdm. Janet pointed out that the interconnectedness of meshing – or is it mashing? 😉 – all these things together helps to reduce information silos. And isn’t finding and using our “stuff” and actually “putting it all together” the whole point of what we are all trying to do when we undertake these digitization projects? Sara Klein discussed her experiences with repurposing the Upper Arlington PL’s CONTENTdm collections for use on Facebook and the Flickr Commons. She has had success in using these social media tools to identify unknowns in photographs, as well as inviting community participation through activities like trivia questions. Breakout session #6 (the final session) options included attending one of two presentations: “The CONTENTdm Catcher: What’s it Good For?” by Phil Sager (OHS) or “The Niiyama Japanese Poetic Pottery: An Interactive Digital Presentation” by Patrice-Andre Prud’homme (Illinois State University). Since I was in fact unsure about what the CONTENTdm Catcher is “good for,” I decided to attend Phil Sager’s presentation. I learned that the Catcher is a web service that can be used for batch processing of metadata. It sounded pretty cool, although unfortunately, it has no pre-packaged GUI, so you need to build an application or use a script to run it. But if you can actually figure out how to do that, it sounds like it is pretty awesome and powerful! I found Phil’s examples helpful in understanding why you might want to use the Catcher (and, by the way, his session title was perfect). One example he gave was, let’s say you have a bunch of Flash videos; you want to set the Format for all of the relevant files to reflect that they are Flash video; and your Source field does include the original file name with extension (*.flv). You could use Catcher to loop through all your CONTENTdm objects, find the ones where Source = *.flv, and in those instances set Format = “video/x-flv”. Pretty slick. You can’t really do that with Project Client (the CONTENTdm GUI interface for editing objects)—not in one fell swoop, for sure. Sounds like the Catcher is a dream for any CONTENTdm Techie who needs to make a specific change to a lot of objects and would like to do so all at once. But Phil warns: Make sure you do a trial run of the potential output before actually changing anything! (There are known bugs, plus there’s always the element of human error.) Look before you leap; that’s good advice for mass updates to any database. The wrap-up at the end of the day consisted of a CONTENTdm Tech Q&A Session with Erik Mayer of OCLC. There weren’t as many questions as I would have expected. Then again, people had been asking questions to the many in-the-know OCLC folks who attended (there were at least 6) throughout the day, so maybe they just had run out of questions! All in all, the CONTENTdm Midwest Users Group Meeting 2012 was a very interesting, informative, and enjoyable conference. This entry was posted in Conferences, Events and tagged cdmmug2012, contentdm, contentdm midwest users group meeting, oclc. Bookmark the permalink.